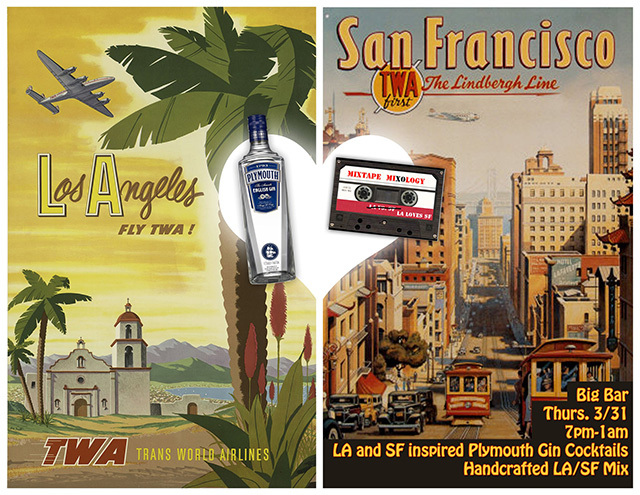 On Thursday, March 31st, Big Bar is spicing up its weekly Mixtape Mixology night with a bit of friendly LA-SF rivalry. Starting at 7pm, San Francisco’s Erick Castro will be mixing SF-inspired Plymouth Gin cocktails, while Big Bar’s Juan Sevilla and Dan Long will be holding it down for the home team. No need to choose sides; whether it’s the City of Angels or the City by the Bay, you’ll be in good hands. To set the mood, Big Bar resident DJ/bartender Eugene Lee (aka Hugenius Leerectus) will be spinning LA-SF music mixes. No word on whether Castro will be arriving in a trolley.